There are some media partners, including www.pjtime.com, www.pdp.com.cn, www.ty360.com, www.projector-window.com, www.ledgb.com, www.jjjlll.com, www.esmchina.com, www.dianzi.biz, cn.made-in-china.com, www.vcg.com, www.av-china.net, International Pro-Audio & Lighting, Audio Engineering, Home Theater, www.yykj.org, and so forth. There is slim chance for traditional CRT display to satisfy people’s ever-increasing demand in display effect, along with rapid development of computer multimedia technology. The rising large-screen projector technology has become an effective way to solve the problem of coloured large screen display, while it gets wide application and its market demand is growing. In 2022, the global LED display market size will reach USD9.349 billion, and the composite growth rate is expected to be 12% from 2018 to 2022. Among them, the indoor small-pitch market size is expected to grow to UISD1.997 billion in 2018, with an annual growth rate of 39%, and its compound growth rate will reach 28% in 2018-2022. In recent years, Hubei has witnessed rapid economic growth and its GDP ranks the seventh in the country. In particular, wuhan has been listed as a national central city with rapid development of various industries and the stronger demand for information media. As a result, the market demand for big screen is enormous. Many industries, including public security, traffic police, telecommunications, banking, securities, communications, transportation, construction, health, airports, military, etc. make higher claims of terminal display devices. 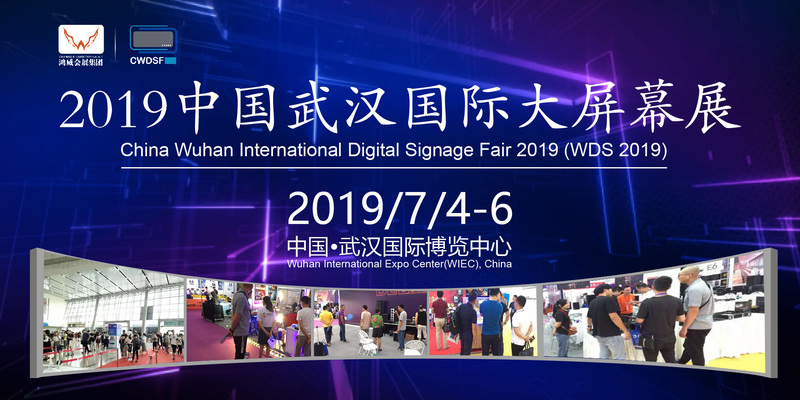 In an effort to facilitate the development of big screen in central China, China Wuhan International Digital Signage Fair 2019 (WDS 2019) will be held during July 4-6, 2019 in Wuhan International Expo Center, with the backings of China Amusement Design Association, Asian Theater & Cinema Association, Asian Association of Entertainment Venue Owners and Guangdong Grandeur International Exhibition Group. BDS2019 aims to build a platform for enterprises and users to exchange and display technology, to power enterprises to tap into emerging markets. New technologies, new products and application solutions: green, environmentally friendly & low-carbon energy-saving new technologies and new products; large-screen system integration application solutions, outdoor advertising application solutions, LED application solutions, projector application solutions, etc. Professional visitors are from government, police station, bank, hotel, subway, airport, supermarket, army, design & consult company, installation company, education, museum, theme park, etc.